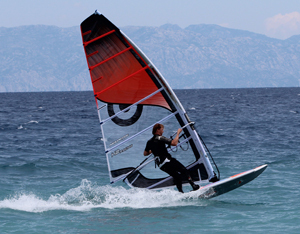 The windsurfing Pro Center – Jurgen Niens/Bertrand Crauzas is situated in Ialyssos close to Ixia. Ialyssos is located on the windy west-side of Rhodes some 7 km from Rhodes Town. 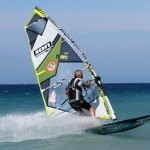 Also read our article about the Freeride and Freerace heaven of Prasonisi, the most southern windsurfing spot on Rhodos. One thing that strikes you when you arrives at the PRO Center is the amount of boards and sails waiting for you and the friendly staff helping you around (also before they knew that we were from Boardtests). 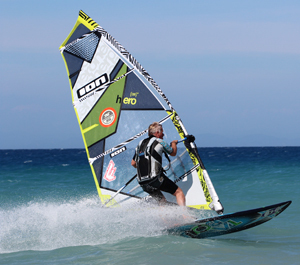 Later during the week we spoke to the founder of the PRO Center of Lalyssos, Jurgen Niens and the philosophy was quite clear “when we recruit our staff/instructors we focus on the person’s skills to handle customers and how to teach windsurfing, not if they can show off a Loop or Freestyle trick in front of the PRO Center”. 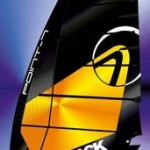 All the PRO Centers will offer you the latest boards and sails from Fanatic/Northsails, Jp/Neil Pryde and Tabou/Gaastra. We where there in May and it was a great feeling to hit the water with brand new equipement, and the feeling was that booms and masts was in really good condition. During our stay we used Neil Pryde Carbon booms equiped with Dakine Vario harness lines. The owner Jurgen showed us around the center and behind the scenes they have a fully equiped sail/board repair station to ensure high quality repairs. Avoiding quick and dirty solutions will keep the equipment fresh through out the whole season. 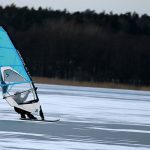 Later during the summer you will be able to test next years windsurfing boards. The Fanatic boards and North Sails will arrive at the end of July. 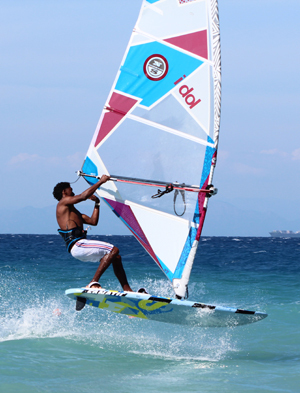 The Tabou boards and the Gaastra sails will arrive in the middle of August. 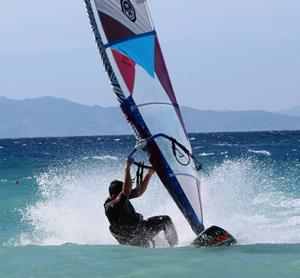 One of the secrets of the windsurfing mecca of Ialyssos is that the area gets thermal wind from the mountains and a wind-channel effect between Rhodos and Turkey. This wind is not included in the wind forecasts for Ialyssos/Ixia area and will often kick in during the afternoon. 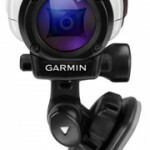 Its almost impossible to predict the winds for the next day just by checking out Windfinder or Windguru. We had a zero-wind forecast for the next day that made us plan a trip to Rhodos old-town, we ended up hitting the beach right after breakfast and got 8 tremendous hours on the water. During our week at the PRO Center the wind speed varied between a few knots up to 24 knots. There were small to medium sized waves. The waves where quite soft and would not be a problem to anyone. If you are a beginner they have a surf-center a few hundred meters north of the PRO center, called The Windmill with less wind and flat water near the beach. Another great thing is that except for other windsurfers there are close to no boat traffic near the windsurfing-area. 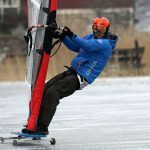 Windsurfingmagazin test winner – A no brainer? NOT! During the week we were able to switch between the centers testing out the freeride- and freerace boards from the different brands. 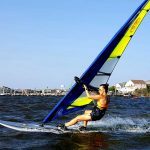 With the latest windsurfing tests in mind we were able to try some of the test winners and were surprised how differently our opinion could be about the same board. 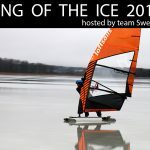 We sailed one of the freeride test-winners from the windsurfing magazines and one of us loved the board while the opinion from others was that the board felt like sailing on a door. Before buying a new board we would definitely recommend a surfing store offering try and buy. As we mentioned above the PRO Centers offers the latest equipment. However one of the highlights were when the Manager Bertrand asked us if we would like to test an old favourite carbon board from F2, the F2 XTC 115 L from 2008. We ended up spending the afternoon with the F2 XTC going as fast and planning as early as with any of the modern boards. At the same time the F2 XTC was a competitive carver and you were able to go really really high with great speed despite the small fin (28 cm Freeride). 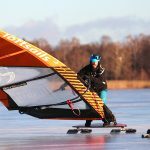 Its a pitty that the F2 corporation have had a bumpy road for several years, on the other hand the shaper Patrik Diethelm, since a few years back runs his own windsurfing board-company, Patrik boards. Definitely worth checking out. We spoke to a Norwegian guy, a returning visitor to the PRO Center for several years. He would go to Rhodos for a second two week session in September planning to buy 1-2 boards to bring home. 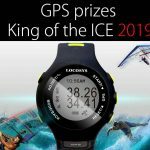 The surf centers will sell their equipment at the end of the season, a great opportunity to test and buy your favourite board, as long as the name of the board isn’t F2 XTC full Carbon that is, according to the Manager Bertrand they will never be at sale. PRO Center – Ialyssos – Any dislikes? The only thing that we missed was some kind of safety deposit at the beach where you could put some cash and camera equipment. During our stay we stayed at Blue Horizon Hotel which is connected to the PRO Center. A nice and clean hotel with very friendly staff. The food was quite good (breakfast/dinner). Things that could be improved: Free WiFi and saftey deposit should be included and if possible some more power in the coffee..: ) There are cheaper alternatives around. Use the map function. The Blue Horizon Hotel is highlighted with the alternatives displayed on the same map. However we were really happy with our stay at Blue Horizon Hotel. When you arrive to a new place the taxi fares often tends to be a ripoff, if you haven’t done your homework that is… Not at Rhodos though where they have fixed rates, and it’s surprisingly cheap. The local buss costs like Euro 2 per person but is hardly worth the struggle if you are new to the Ialyssos/Ixia area or if you arrives with a early morning/late evening flight.